When Pele Sports were tackling the challenge to design the world’s fastest speed boot, they felt it imperative to have experts in all fields of technology involved. They enlisted Within Technologies to work with them to develop new ways to lighten the Trinity 3E. The collaboration has resulted in a design proven to improve player performance and overall speed on the pitch. This was achieved by using Finite Element Analysis, typically the preserve of the Aerospace and Motorsport industries, to fine tune the unique design provided by the Pele Sports team. 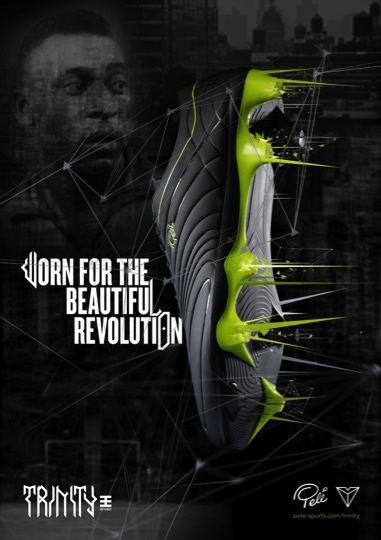 Each element had been carefully engineered; the outsole, the stud shape, the stud tips and the unique positioning of the studs to mirror the natural motion of the foot in all conditions. The boot is made of lightweight but durable materials developed by the Pele Sports team and manufactured using advanced shoemaking methods. The outsole has been constructed in a dual-density material, which allowed Within’s design team the freedom to vary the rigidity for optimum muscle stimulation, resulting in flex zones and stiff areas. The unique asymmetrical stud geometry echoes the asymmetrical motion of the human foot. The stud layout works to evenly distribute foot pressures while improving stability and traction. This reduces energy loss, which is an issue with other cleat configurations and allows for high velocity release by the player. Injury prevention was a priority for the design team - the outplate was designed to resist rolling over of the ankle and the stud shape was adjusted to allow for better rotational movement, maintaining excellent traction with superb mid-foot stabilisation. The Pele team has had such positive feedback for the outsole design (including an award for innovation) they have patented the stud geometry and released several more versions in the Trinity 3E range. “Right from the start I was impressed by the quality and accuracy of Within’s engineering and construction. The interpretation and attention to detail was excellent, helping the design to gain FEA approval and scientifically proven performance verification throughindependent test sources.” Greg Lever-O’Keefe ‘Head of Design Pele Sports’.